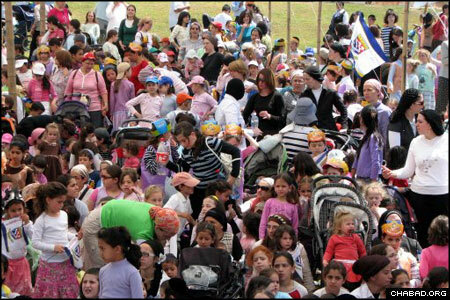 More than 1,000 children turned out for Lag B’Omer parades in the Israeli city of Bet Shemesh, where two gatherings coordinated by the town’s Chabad-Lubavitch center and the local municipality stopped traffic and drew spectators to join in. 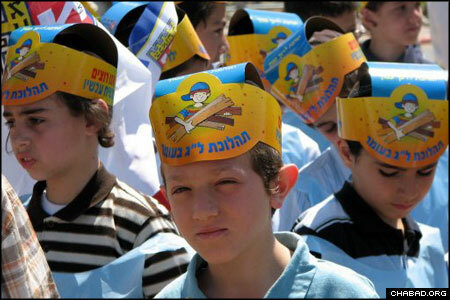 In the suburb of Ramat Bet Shemesh, rabbinical students donned costumes depicting oversized ritual items such as charity boxes and Torah scrolls. 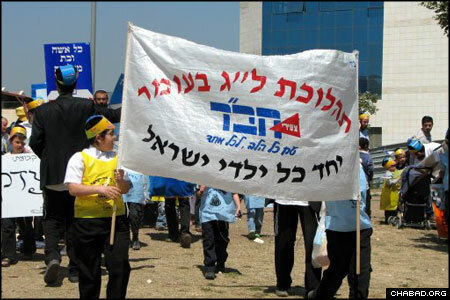 The central Lubavitch Youth Organization in Israel provided many of the props for the parades, from signs and banners to copies of a children’s book released in honor of the holiday. 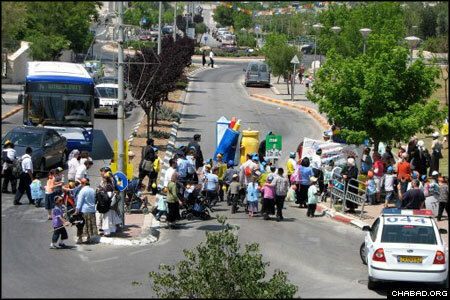 Similar parades took place throughout Israel. When they arrived, boys and girls were separated into groups for the march down to an assembly at a local park. 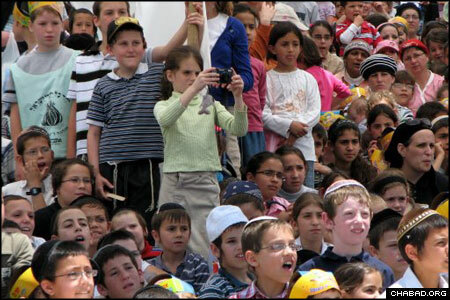 To warm up the crowd, counselors and children shouted verses from the Torah. 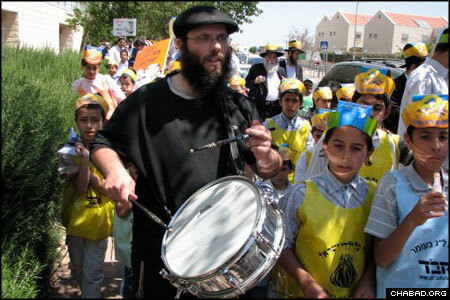 Moshe Yankovsky, drummer for the Chasidic rock band Yood and a Bet Shemesh resident, keeps time for the marchers. 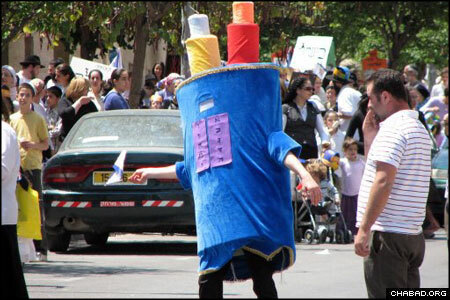 A marching Torah scroll helps direct traffic. The march proceeded to a local park, where an assembly included a juggling demonstration and a raffle of prizes. 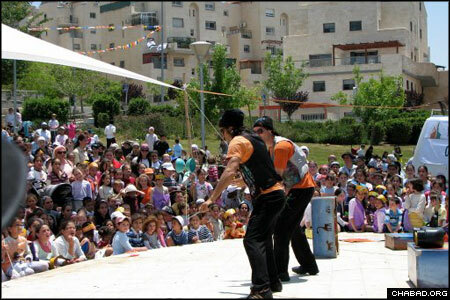 A similar event took place in downtown Bet Shemesh. All told, more than 1,000 children participated. Jugglers kept the crowd entertained in between speeches and sections of the raffle. 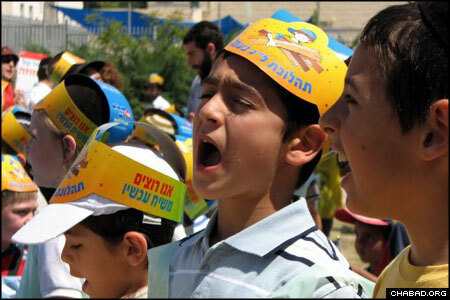 After the performance, the children received a copy of a children’s book released by the Lubavitch Youth Organization in Israel.